← It’s grace, grace, God’s grace. What next, the golden dome at Notre Dame? 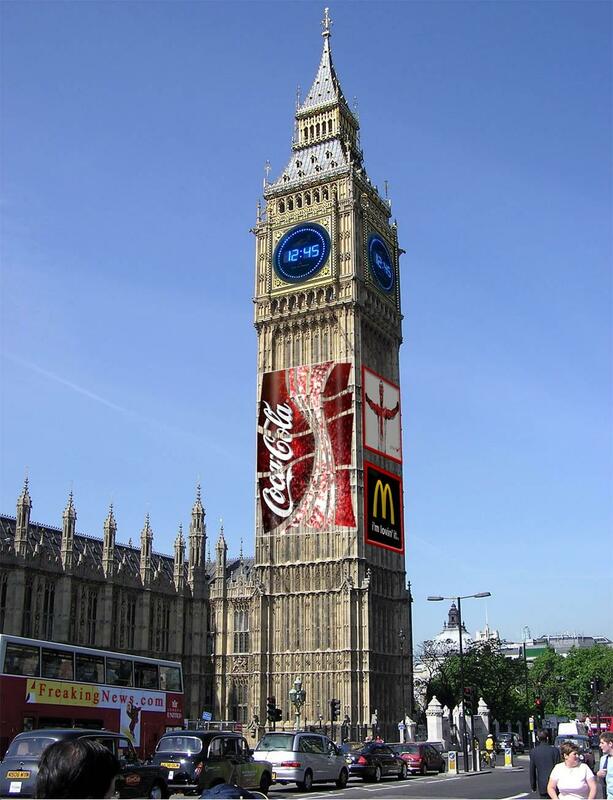 Today, it was announced by the London Daily Sunday Times that the famous and iconic clock Big Ben would be going digital. Not only would it be going digital, it would also be featuring advertisements. “This is an effort to bring the historic land mark up to the contemporary times”, said Ian McFane, with the British Travel Ministry of London and Buckingham. He also went on to say that “the advertisements were an effort to bring in revenue for the faltering British economy.” I have to imagine what the Old English gents in London think about using this once historical and traditional center piece of the old city for this means. ht – Post at ReallyRobins. Happy August 1st. Well, I’m glad I saw the “prank” tag before I went off on this!!! Nothing would surprise me anymore! Thanks for the HT, baby – and thanks for the August Fool’s smile! You almost had me. However, I couldn’t help thinking that it wouldn’t really surprise if they did do this. Can I ask – who did the graphic? Good job of applying the clock and the adverts. The picture I found at freakingnews.com which you can see in as a banner on the bus in the picture. It was old prank done in 1980 and made the list of the Top 100 April Fool’s Day pranks of all time. They did a great job.